Footage of a violent zebra attack on a Chinese zoo keeper has been published online showing the animal dragging the man around its enclosure. 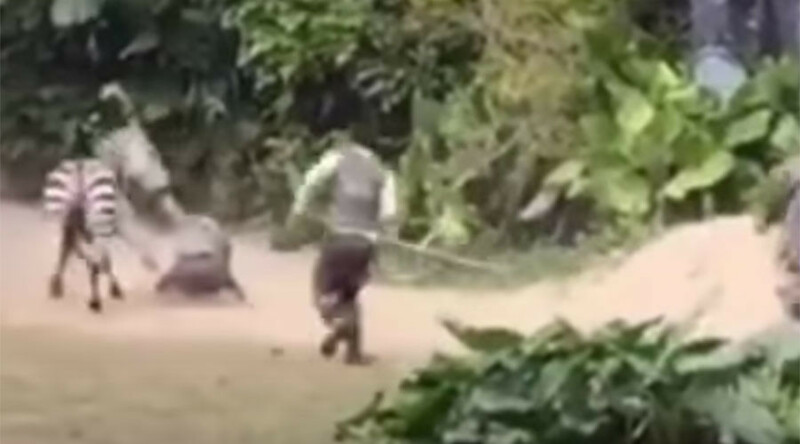 Recorded at the Chimelong Safari Park in Guangzhou, northwest of Hong Kong, the man can be seen being dragged by the arm across the ground while fellow workers chase after the pair. It is not known how recently the incident occurred, although it’s understood the man suffered only minor injuries after his colleagues intervened and were able to free the man after a couple of minutes, according to the Shanghaiist. The video was released just days after another video emerged showing a man being mauled to death during an hour long tiger attack at Youngor Wildlife Park in Ningbo. The unfortunate individual reportedly scaled the wall of the attraction with the intention of avoiding the entrance fee, only to end up surrounded by the vicious cats.